If you are actively seeking a piece of Fort Lauderdale real estate, roof inspections should be high on your list of "things to do" to ensure you are not buying into an expensive repair project. Given Fort Lauderdale’s torrential summer rains, blustery winds and high humidity, roof leaks are not uncommon despite how well the rest of the residence is constructed. Roof leaks can be sneaky and easy to miss. The pure volume of rain, the driving winds and damaging UV rays can force water into areas that you wouldn’t normally consider possible; and that’s precisely why you want a home inspector that has extensive experience inspecting roofs in a sub-tropical climate. At Windridge Olin Exports we have built and inspected hundreds of upscale homes in both South Florida and the Bahamas. We know where to look and what to look for and most importantly, how to repair any potentially damaging roof leaks. Roof leaks are more than just an annoyance that stain ceilings and walls. When moisture mixes with warm air it can encourage rot, even on structural components, and unhealthy mold. Living with leaks is not an option. Leaks have to be repaired and you can hold down the cost of that repair if your contractor is experienced enough to find them without spending hours searching for them. The first place your roof inspector should look is in the attic. Leaks don’t necessarily make it straight down to the ceiling however they will leave a trail in the attic where they can spawn rot and mold. Finding evidence of leaks does not necessarily mean you found the leak location. Water can run along joists from one end of the house to the other. Loose flashing is a common entry point for wind driven rain. An inspector who finds loose flashing should raise it to see the extent of the damage. Gutters can hide a multitude of sins. Poorly installed or loose edges will allow the rain to pour down the fascia rather than into the gutter. 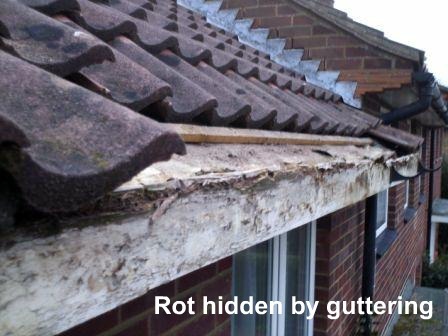 Rot can easily form without being noticed under the cover of the gutter. Sealant on ridge vents, particularly if silicone is used, will degrade leaving seals open and exposing nails. Depending on the damage, roof repair may be the least expensive of the repairs needed. When water finds its way into the wallboard you can almost count on a mold removal issue. Ensuring the roof is secure is an important element in evaluating the true cost of a Fort Lauderdale home. Make certain your home inspection team is experienced and up to the task.